We’ll open our doors October 4th from 10am to 4pm. The solar tour is a chance for home owners that have installed solar of some kind to open their doors the first weekend of October to answer questions about living with solar. 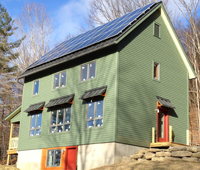 To see solar homes on the tour in your area, go to the National Solar Tour. If there is not a tour in your area, you can zoom into the map to find homes near your location. Hopefully the sun will be out and the meter will be spinning backwards!